On Fridays, we gather at Lisa-Jo’s place in reckless abandon with words and hearts and comment love for as many as we can visit, but especially the one that linked up just before. 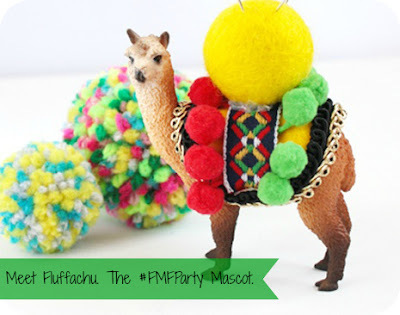 Some are bleary-eyed from a late night gathering we call #FMFParty on twitter. Some are scraping to find the 15 minutes it takes to write, find the perfect right photo and then post. Whatever your situation today, I’m glad you are here and I offer you a cupcake as a reward. Enjoy!! It has ZERO calories or fat! As a bonus, I want to introduce you to Fluffachu, the unofficial mascot of #FMFParty. The photo is courtesy of the ever-lovely, uber-ninja Crystal Stine. She can often be found occupying the #1 position on this here link up. If you want to learn more about the origins, search #Fluffachu on twitter and have a read. Oh, yesterday was a day of leaping. Not of leaping for joy or playing leap frog with the little in the yard, but the big girl kind with prayers, and knotted stomach. The first was more of like a scary free fall as I wrote about a phobia I’ve had. Trembling hands hit publish and the photo at the end was still hard to look at without hyperventilating a little. The second was a bigger leap. This was the leap from a steady, even place of minimal responsibility to much higher ground. This leap, if I don’t quite make the other side, will let down friends, me, and I fear God – but I know I can’t make it on my own strength. The third leap – well, I’m praying, bending the knees, swinging the arms, building momentum. Leaping can definitely be scary. Good for you for not letting fear overcome! I still have the fear, but keeping an eye on it keeps it in check & me on my toes. No fear! You'll never disappoint or let God down. He loves you perfectly just as you are - so, no worries there. :) Here from FMF! Have a lovely weekend! That really means a lot to me, thank you for those words of truth and encouragement. You sister - You ROCK! I love that you jumped yesterday in sharing your heart and life with us. Have a kickin' weekend!!! A kickin' weekend sounds like a great idea. I love how we are all getting to know each other here in these little pockets of space. Just jump !!!! Yea that is easy for me to say sitting on this side watching isn't it. But honestly if you jump God is standing there ready to catch you. Have a great weekend. It is so much easier to see when it's someone else. If we can quiet our own voice to hear all the support around us we can be so much braver. Thank you!! Oh those big girl jumps are hard to do!! Bon Courage friend!! Great post! I'm on it! You'll do great, I have no doubt! He's got you! Take His hand and jump! Thank you, sweet Barbie! Perfect advice for any situation.